Well I did make it to Prairie Dog Town during my trip to Lubbock, TX. 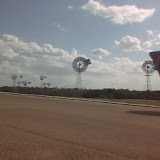 I also drove by the wind museum. It closed each day about the time I was finishing class, but I was still able to view the windmills of various years that are outside the building.